Last August, Feel Good Friday introduced you to the Food Recovery Network at the University of Maryland. Today, we're taking it from college campuses to the grocery stores near you! Well, near you if you live in Boston. "Lovin' Spoonfuls is an organization that facilitates the recovery and distribution of healthy, perishable food that would otherwise be discarded. Lovin' Spoonfuls works efficiently to deliver this food directly to the community organizations and resources where it can have the greatest impact." As they explain on their website, in the United States we throw away 40% of our food while 49 million people in the country go hungry. Ashley Stanley experienced this first hand one day when she saw produce in the back room of a supermarket that was going to be thrown away. 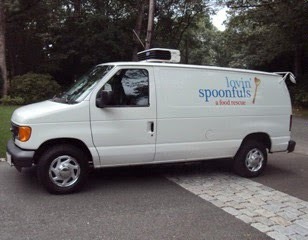 She put it in her car and drove it to a homeless shelter and that gave her the idea to create Lovin' Spoonfuls in 2010. Now in 2014, they have 3 refrigerated vehicles on the road collecting food from such partners as Whole Food's and Trader Joe's. Since their inception they've distributed 1.3 million pounds of rescued food in the Boston area! To learn more, read this Christian Science Monitor article, watch a short video on their mission page and meet some of the people involved or like their Facebook page to stay in the loop.